Can a City Get the Measles? No, but it can almost look like it on GoogleMaps. This is a slice of the west side of Las Vegas (where I am today)--the more recently developed part of town (the 1990s and this decade) out to Summerlin. 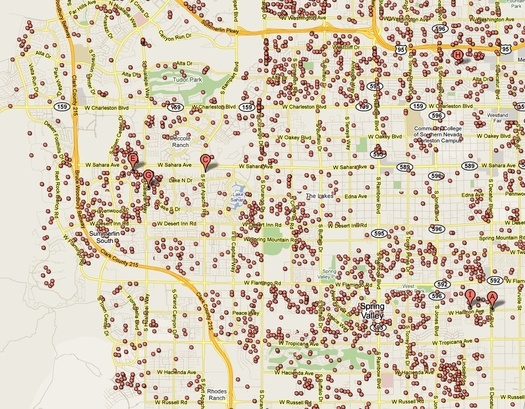 Each red dot represents a house in foreclosure. And this surely understates the number of homeowners behind on their mortgages. Add to this the likelihood that a high percentage of all the homes in this area have negative equity (because many were bought in the last few years during Las Vegas's rapid growth, and where the housing bubble got blown up larger than other places), and you can probably get good odds here in a betting house that there is a lot more trouble still to come, and you begin to have a sense that the Great Reset, or whatever we're calling this economic cycle, is going to take a long time to work itself out. What happens if these neighborhoods never come back? See: Detroit. LA is not Detroit. These houses have or had people in them who moved somewhere else or will move somewhere else - probably in LV and probably into a foreclosed house. They may have to rent, in which case an investor will have to buy the house and rent it to them. The issue is that the houses are not worth the mortgage balances carried on them. The mortgages have to be written down or written off and someone will pay the price - either a bond investor or a bank or the government. Presumably the homeowners have already been wiped out. Any effort to forestall foreclosures delays the resolution of the problem. What happens if these neighborhoods never come back? See: Detroit. I understand the point you're trying to make here ... but Detroit is an entirely different case. Vegas has suffered a rather sudden wave of foreclosures due to the reasons you cite. Detroit, on the other hand, suffered from no such thing. I am from Detroit, and I can say from personal experience that it was a troubled but not dead city in the aftermath of the 1967 riots. I blame the death of Detroit on Coleman Young, who gained the mayor's office in 1974. He was a classic "us against them" politician -- with "them" being whites, suburbanites, the state government in Lansing, etc. He laid the foundation of the culture of utter corruption that is Detroit to this day. Kwame Kilpatrick came by his disgraceful roots honestly. Every year it seems we hear a news report of more graft and corruption in the city. The city's school system is a complete disgrace. The graduation rate is about 25% despite spending $11K per pupil. The functional illiteracy rate nears 50%. I can't find statistics on this, but I'd be willing to bet the number of "administrators" and teachers who don't actually teach is staggering. Incompetence yields a cushy office and a large salary to do nothing. My emotions about Detroit run hot. It is a pathetic shame that the city has devolved to the point it has. But the blame is not due to any "external factors" or "changing economic conditions." It is due entirely to an utterly bankrupt moral culture in the ruling "class" of the city. Las Vegas will survive. Detroit will not. I was fortunate enough to buy a home in Vegas in 2000 as the market was roaring and sell in 2004 just before the crash arrived. The profit I made provided a down payment for my next home. In California. Which, luckily, I also escaped before the apocalypse. Then again, I was charmed. Or something. To see Don's personal-angle point highlighted by a top scholar, read the utterly-riveting account of Detroit's fall due to black power politics at their vengeful and corrupt worse (a phenomenon of course not unrelated to, but by no means excused or entirely explained by, how the white leaders of Detroit had allowed blacks to be treated prior to the mid-60s) in Tamar Jacoby's Someone Else's House. That book compares what happened in Detroit to what happened in New York City (not as bad) and Atlanta (not as bad as either case) vis-a-vis race relations and city politics. A wonderful (if often making one wonder at how appalling bad things can get) book. Don and Charles make good points about why Las Vegas is not like Detroit. But I'm not so sure. It is not clear to me that the folks who have been foreclosed upon in Vegas have stayed there in rental houses. The population in Vegas is and has always been highly transient, and until we have some Census data (which may or may not be helpful), I think it is possible that a large number of people may have left the area for someplace else. Second, although Vegas does not have the same poisonous racial politics as Detroit, the gambling industry does face some Detroit-like problems--namely, the competition from growing Indian gaming and other legalized gaming that is presenting serious competitive pressures to its high fixed cost structure (which includes a strong union presence in all the hotels, etc.) Third, one other difference is that Detroit eroded from the inside out--that is the central city gave way to the suburbs. In Vegas right now, the worst neighborhoods (the ones with the highest foreclosure rate) are all on the periphery. If you do the GoogleMaps real estate foreclosure function for the entire LA metro area, you see a central city sprinkled with a lot of red dots, surrounded on the edge with what looks like a big red circle. Though I live in North Carolina now, I'm from Flint and I have always been a student of what happened to Michigan. In the 1950's those two cities were in place at the top of the entire world in terms of household incomes. Now they are both beyond bankrupt. Do yourselves a favor and review what happened in Michigan as a result of Lyndon Johnson's "Model Cities" project. This was an attempt to engineer communities to the extent of dictating how many children would be taught certain skills to support the requisite jobs to support the community. Grants were given out for skill training specifically based on what the community would require. Stores were allowed to lease based on whether or not their services would be "needed" to support the community and it's goals. What Mayor Young loved to call "White Flight" and most of what is now called the "Race Riots" were a result of the community reacting to this experiment. Sadly, Michigan is doomed until they realize that the jobs, college graduates and "rich" people aren't leaving because they hate Michigan and Michiganders. They are leaving (have left) because their strident pro-union, anti-capitalist politics. As a result of this, Michigan, even with its remarkable pool of professionals, along with infrastructure, and natural resources, thanks to the extensive highway system and the Great Lakes giving them access to the world, is not viable for business development. I love my home state. It sometimes feels like I'm mourning a family member with an addiction, or one who has committed suicide. Sorry folks. I didn't mean for the previous submission to be "Anonymous."